A newly discovered fungus species, Cortinarius ceskae is highlighted in today’s BPotD. The species is named in honour of its discoverers, local mycological experts Oluna and Adolf Ceska. Oluna and Adolf collected this species as part of a decade-old macro-fungi survey of Observatory Hill in Victoria, British Columbia, Canada. So far, the species has not been found on any other site. Thank you for sharing this exciting discovery (and photograph) with us, Oluna and Adolf! Oluna Ceska, with the assistance of her plant ecologist husband, Adolf, has been observing and collecting fungi from Observatory Hill since 2004, and has made over 300 collection visits to the site. From these visits, Oluna has collected records of well over one thousand species of fungi from a less than 75ha (<185 acres) area. Last year, Oluna and Adolf donated 3312 dried specimens to the Beaty Biodiversity Museum, and over the last decade the Ceskas have been responsible for filling one quarter of the the Museum’s 26771 specimens of fungi. 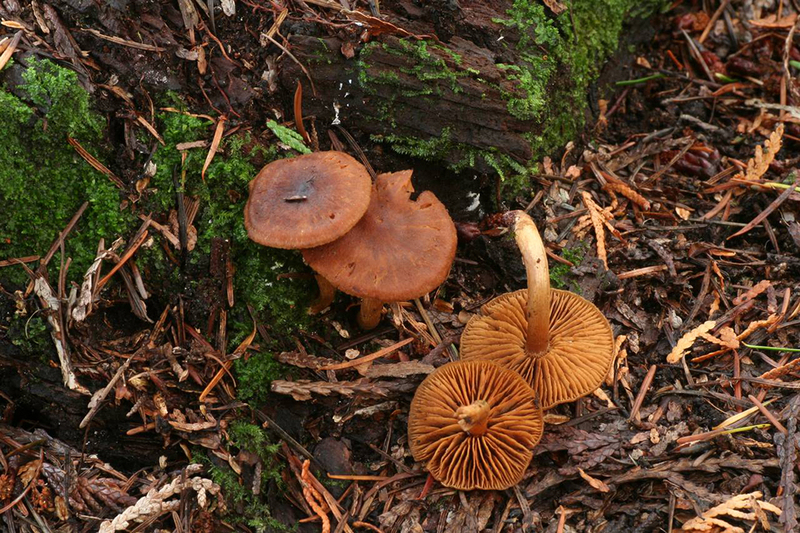 The specimens collected by the Ceskas have resulted in many new species records for British Columbia, and also a number of newly described species, such as Cortinarius ceskae, which was published in the Index Fungorum in 2014. Pileus 20-30mm, at first conical, later almost plane, often with an acute umbo, reddish to rusty brown with an olive tone. Lamellae moderately spaced, cinnamon brown when old. Stipe 30-50mm long, 4-5mm thick at apex, cylindrical, fibrillose-rusty fibrils over yellowish background, base of the stipe yellow, at least when young. Context ochre. Odor in lamellae radish-like. UV fluorescence: pileus bright yellow on drying, lamellae bright yellow but patchy, stipe bright yellow, flesh in stipe pale yellow. Daniel adds: Adolf has run the botanical email newsletter, Botanical Electronic News, for well over twenty years. I remember it being the one major thing that kept me in touch with the botanical world in the gap between the time when I finished university and later started at the Garden. If you are interested in botanical happenings (in particularly western North America), subscribe now and your first BEN will likely be the annual April 1st special edition. Observatory Hill collections of several species have been directly cited (or referred to by their GenBank numbers) in the original descriptions of some of the following species: New and Interesting Species from Observatory Hill. A majority of the Observatory Hill collections were donated to the UBC herbarium where the collections have been already accessioned or are waiting for being accessioned. Many of those collections have been already included in the UBC Fungi Herbarium database and mirrored in the Consortium of the Pacific Northwest Herbaria. A “virtual herbarium” has been created in Mushroom Observer. It contains photos, microphotos, and drawings of about one third of all our Observatory Hill specimens. Partial results of the survey have been summarized in annual reports that have been deposited on the GOERT web site. This project was partially supported by the Herzberg Institute of Astrophysics, GOERT (Garry Oak Ecosystem Restoration Team), and private donors. Cataloguing of the collections has been supported by the Canadian Wildlife Service. Our special thanks go to Dr. Paul Feldman, HIA astronomer, who initiated this project and provided all the help we needed.